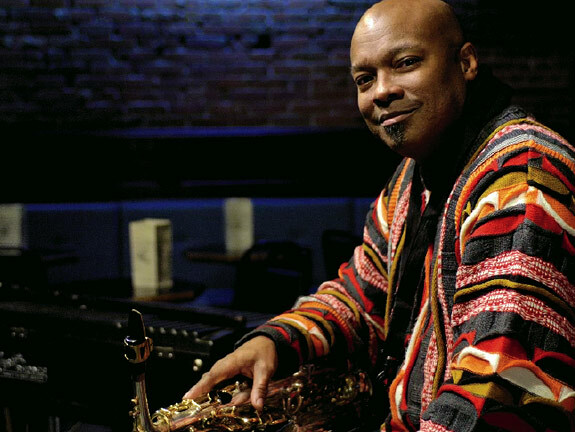 Horace Alexander Young '83 teaches woodwinds and jazz studies at Washington State University and tours the world as a member of Abdullah Ibrahim's jazz sextet, EKAYA. He plays woodwinds, keyboards, and percussion. 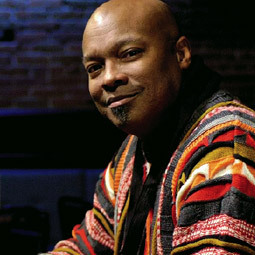 He also sings and composes, and has done arrangements for and performed with a variety of musical artists including the Madd Hatta, Nancy Wilson, and B.B. King. He lives in Pullman with his wife, Phyllis, and children, Victoria and Alex. He shared his thoughts on crafting a life of recording, performing, and teaching with Hannelore Sudermann during a visit at his office in Kimbrough Hall. My parents thought music should be a part of a basic, well-rounded educational experience. It was not their intent for any of us to become musicians. I started with piano when I was eight years old. I took lessons for two years, along with my older sisters. I had to go to ballet lessons with them, too. I really wasn't feeling that. My piano teacher's daughter had some plastic flutes around that they gave me, and I learned some fingerings. I knew that if I took flute lessons, that was my way out of having to go somewhere with my sisters. I would have my own thing. Take breaks—good things will come. After college I had gone to the Shepherd School of Music at Rice University, but I started burning out. So I took two years off. I was doing a bunch of freelancing in the Houston area. I had started teaching. I was on campus at Texas Southern and passed by an announcement for a TA job at WSU. The job description was everything I was doing in 10 different places. I figured, I can finish my degree, get paid for it, get two years of college teaching experience, and get away. Time flies, even in Pullman. Pullman back then was very, very remote. I came here for a very specific purpose: my education. I didn't have a car. I was away from a city of several million people to a place where I could hear myself think. The two years went by real fast. For me it was perfect. In 1986, I moved to New York. That's where I discovered that music is really what I wanted to do. That whole thing about being willing to starve for it, that's overrated. But are you willing to tolerate the rigors of the profession? Could I be away from my house in the United States for five weeks, in countries where I don't speak the language, in hotels where there's only one bathroom at the end of the hall? Could I be on a tour bus with a bunch of guys, some of whom don't necessarily have the best social decorum or personal hygiene? Wait for the whole story. An agent called me and asked me to audition for Abdullah Ibrahim. I got there and realized it was fixed. They guy who was leaving the band was trying to get one of his friends hired. He was actually sitting next to me coaching this other guy through it. But Abdullah told his manager, after he heard us play the very first tune, that he wanted to stop the audition and hire me then. So he left the room. The manager left the room. The guy who was the musical director left the room, and this guy who was leaving the band left. They had a 30-minute conversation in the hallway. Abdullah wanted to stop the audition and hire me, and they were trying to talk him out of it. I found out about all of this at two o'clock in the morning, because his manager called me up and said, "I'm sorry to call you so late, but something told me you were not planning to come back tomorrow." I said, "You're right, because this is a fixed audition, and I think I'm wasting my time." He said, "He wants you to come back, he really wants to hire you, but he wants to go through the second day of auditions to keep his word." Music can take you around the world. I've played in every major city and most secondary markets. As large as Berlin and as small as Buxtehude [pop. 40,000]. In Germany I played in a theater where Wagner staged his operas. That's pretty overwhelming to be in a venue with that level of music, and the importance of 19th-century German opera, . . . performed on the same stage where I was playing a jazz concert. That was just phenomenal to me. It's not that having an ego is a bad thing. If I didn't have somewhat of an ego, I couldn't play music. It's an extroverted side that I think needs to be there so you can take chances for your audience. I've operated my own record label for the last 10 years. That's been wonderful. It started in the time when the independent part of the music industry was just starting to flex some muscle through the Internet and downloading and everything. It's more advantageous for more musicians to become connected with independent, medium-size labels, or to be enterprising. You have more artistic freedom. I met my wife in Houston on a Motown revue in 1994. She was a choreographer, and I was working on the vocal arrangements. I was driving her to lunch, and as we got out of the car, I had a flash image of a photograph of me and her and two kids. It was time-stamped to the year 2000 with a little girl that was around five and a little boy that was roughly around two in a room I didn't recognize. I almost fell back in the car. The last thing I was thinking about was getting married, or getting involved with anyone in the entertainment industry. In the year 2000, my son was two and my daughter was five, and that room was in Pullman. I had a small daughter, and I was trying to phase out heavy-duty touring. In 1997-98, WSU started an initiative to diversify the faculty by creating positions. Various departments put in proposals to interview target people who had a certain collection of skills. I got a call. I was told, "You wouldn't have to quit touring. Maintaining visibility is part of the whole tenure-track thing." And then they discovered my wife taught dance and was in theater, and they had been wanting to restart the dance program here for quite some time. When somebody offers your whole family a job, you move. When I started at WSU, I don't see it as leaving performing and recording to teach. It's all part of the same mission. Why shouldn't I teach? Mozart had students. That kind of puts it in perspective. If Mozart and Bach had students, then who am I not to?